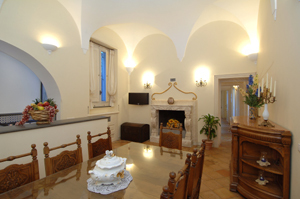 Villa il Baglio lies about 3 kms from Amalfi. Its origins go back to the XIIth century, and the two types of barrel vaults, the old well and the remains of a wall are all witness to the medieval origins of this villa. The villa stands on the slopes below the famous Santa Rosa monastery and is surrounded by vegetation and absolute peace and quiet. The villa enjoys a breathtaking panorama where you can admire the splendid view of the sea and the coast stretching from Amalfi to Conca dei Marini. The villa is on three floors and has a surface area of about 300 sq.m. with splendid well-equipped external areas of about 700 sq. metres. It has recently been renovated with care down to the smallest details. The villa has many modern comforts such as air-conditioning, satellite TV, heating system, emergency lights, mosquito-netting, telephone linked to all of the rooms, internet connection, CD, DVD and DVX player, hair-dryer in all of the bathrooms. The furnishings are elegant with refined details, from the silk curtains to the period furniture. A private swimming pool of 5x8 m has also been built with massaging water jets and with the possibility of being heated. The ideal location of the villa allows you to easily reach many interesting nearby towns such as Amalfi, Ravello, Positano and Capri. (Access to the villa via about 90 steps) FIRST FLOOR: from the entrance gate 12 steps lead to a panoramic terrace introducing you to the villa and to the annex. Atrium furnished with easy chairs and small wicker tables, living-room/dining area with corner kitchen, 1 double bedroom with ensuite bathroom with shower, 1 double bedroom with single sofa-bed with ensuite bathroom with shower, looking onto the old XIIth century well. SECOND FLOOR: 30 external steps give access to the upper floor and to the main part of the villa, surrounded by a magnificent terrace with garden furniture, living areas and chairs for relaxing, external shower (hot and cold water), embellished by an old well. 2 entrances to the villa. Studio, 1 double bedroom with panoramic window, 1 double bedroom, bathroom with shower/sauna cabin, living-room full of light with double sofa-bed and access to the panoramic terrace (about 30 sq.m. ), 1 double bedroom with access to the panoramic terrace, a corridor furnished with cupboards with gold finishings, large bathroom with hydromassage bathtub, large and light well-furnished kitchen/dining-room with fireplace. THIRD FLOOR: an external staircase leads to the uppermost floor of the villa: External area for laundry, sunbathing terrace with outdoor furniture and shower. Access to the mansard, small living-room with corner kitchen, single sofa-bed, double bedroom, bathroom with shower. Other services included in the price: Cleaning during the week 5 hours, 5 times per week for a total of 25 hours per week. Parking for 2 cars, baggage transport. Additional beds cost (2 available): 300 Euros per week, to be paid on the premises.